ok, I have switched gears again, a little. I followed Troels advice and when and got some Sap green and I started to see what I could do in a different spot. I used just the Sap green, some ultramarine blue, and white, and a little yellow ochre. I just worked in a smaller area, keeping the colors a little lighter than what I wanted them to dry. I still see I have to blend more so it does not look like balls of green, I also like the highlights on the upper trees better. I think that if I want them to push back and be more blue I will try what Mark recommended and us a wash, it work well in an area it tested it. I just got back home from a few day trip to Rainer MN. Ranier is located just a couple miles east of International Falls MN and is almost as far north in MN as you can get. 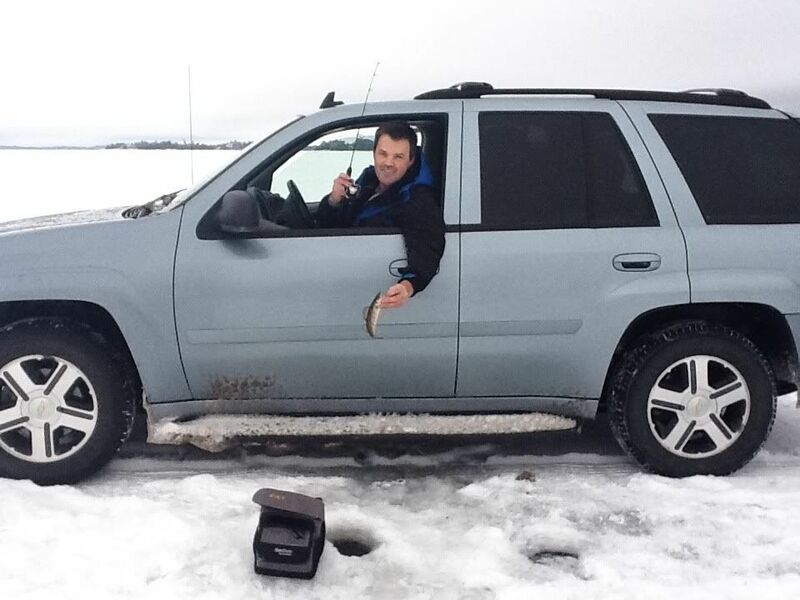 I went to Ranier to do some ice fishing for a few days with my son. I am pretty proud to be a hardy Minnesotan but these people that live in Ranier / International falls make me seem weak. Where I live we see temps that typically only reach -20F (-28C for you folks on the metric system), even our coldest temp ever recorded was only -41. 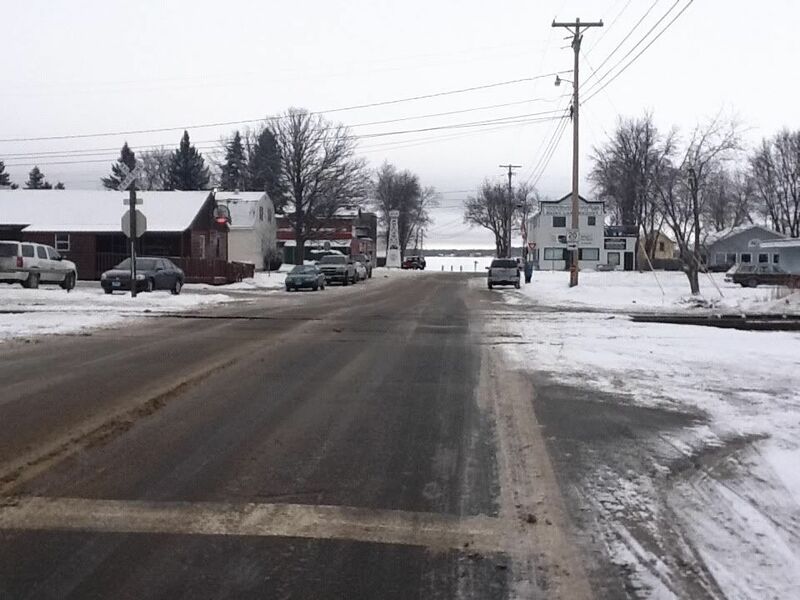 These folks in Ranier see that normally and have recorded temps into the -60s degree F.
To get to Ranier we traveled through the heart of the Iron Range, or Da Range as most people that live there call it. 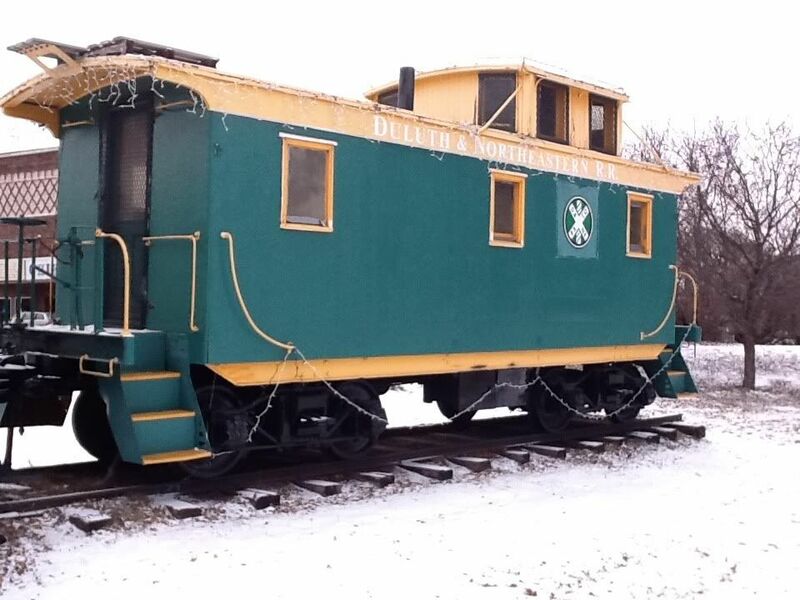 The Range has a lot of railroad history and some really neat only buildings to see. 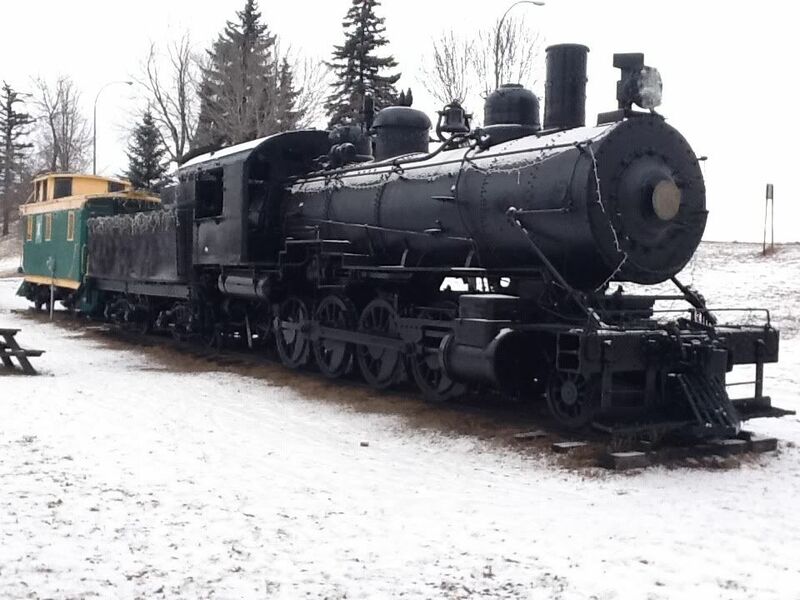 We could not stop and see any of it because we were on a pretty tight time schedule, which my teenaged son kept, but I did manage to get a little train watching in and sight seeing in if it meant not going too far out of the way. I booked a few nights stay at a lodge in Ranier, which unknown to me was only a block away from the crossing of the Canadian National railway into the US via an old single track draw bridge. 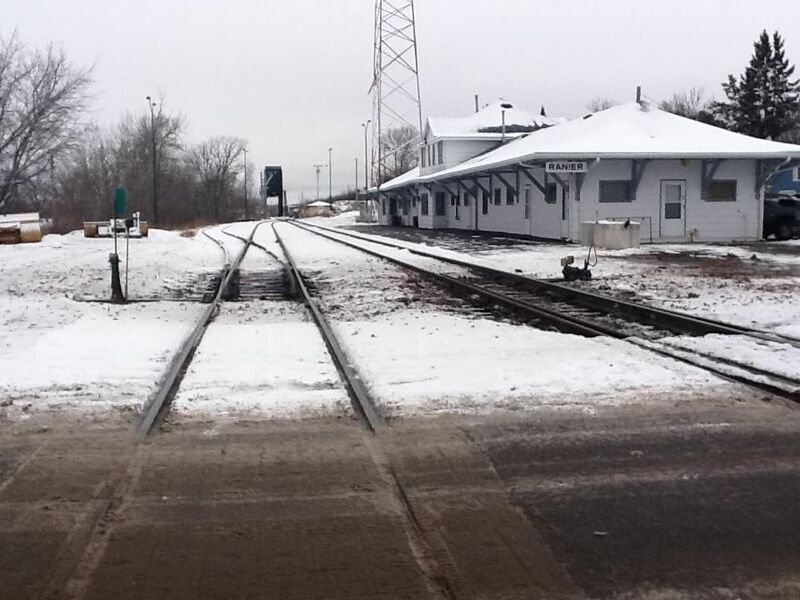 After the CN crossed the Rainy River into the US the CN had a depot and the tracks split into three tracks. 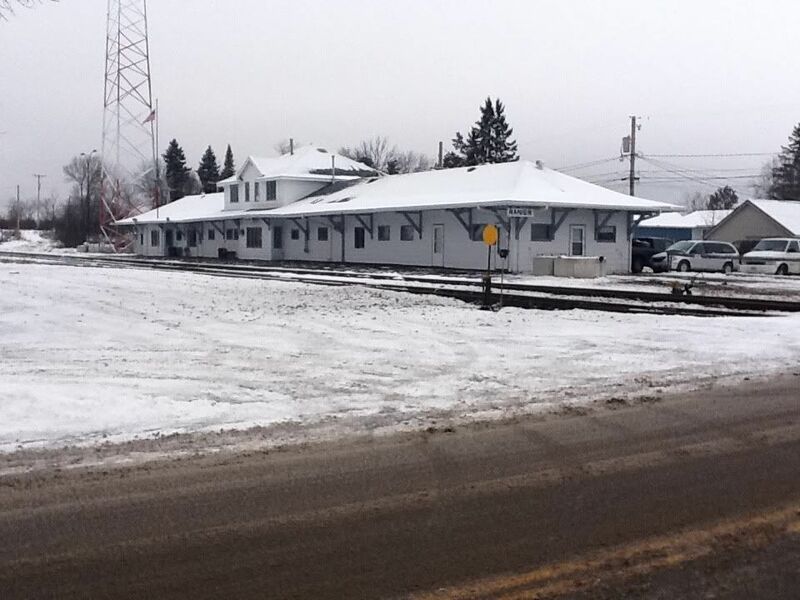 Just across the tracks was the lodge we stayed at. We rented a room above the short stretch of stores on the left side, ours was an attic room converted into a three room "cabin". The entire ceiling or our "cabin", as they called it, was sky lights and at night I could lie in bed and look up at the stars, pine trees, and falling snow while I listened to train after train crossing the border. The crossing was protected by only a set of cross bucks so every train had to blow its horn, which the engineers kept to the bare minimum out of respect for the locals. 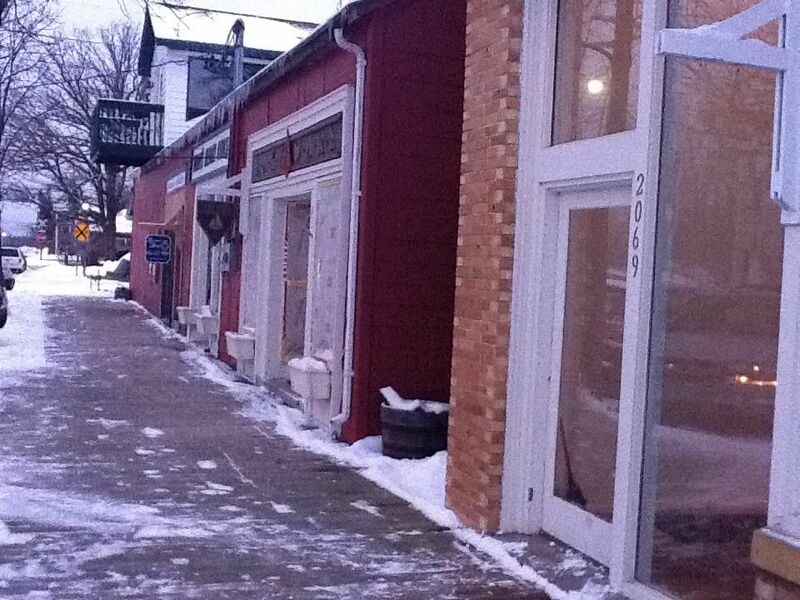 Our place was just across the street, on the left, in the red brick store. The lodge was across the street from us and that is where we meet the owner who took us out on to the lake to show us the fish house we had rented. The lodge was a cool old building. 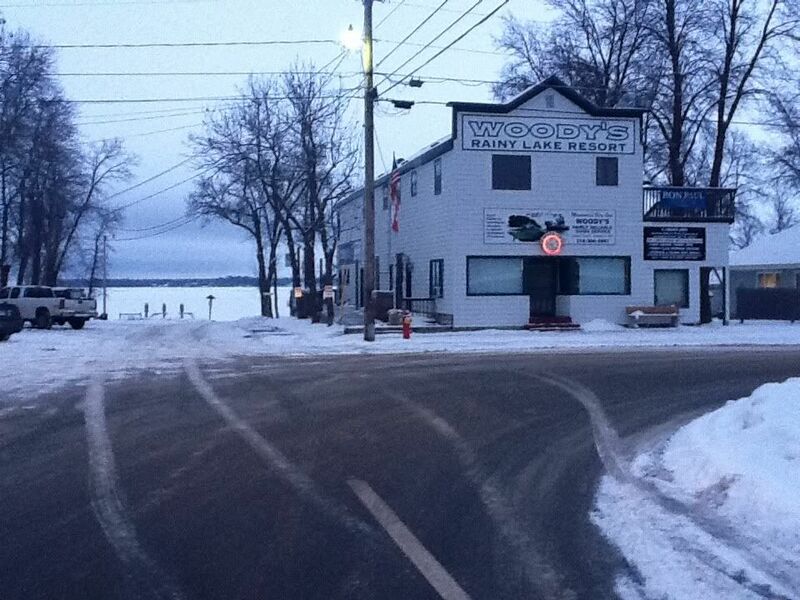 We spent three days out on Rainy Lake chasing, most waiting, walleyes. The weather had been really warm this winter and the lake has had a hard time freezing up, so most of the lake was unsafe to travel on with cars, and since we had left the snowmobiles at home we were pretty much restricted to our rented ice house. The ice house was constructed of ruff sawn timber framing covered in some kind of tough fabric. The interior dimensions were about 8 x 12 feet and there were 12 holes in the floor to fish through, a table, a single light powered by a 12V deep cycle battery, and a propane heater mounted on the wall (the tank was outside). The first day the temps started out at just 4 deg F, but warmed into the high teens. The heater struggled to keep up but by the second day the temps were in the 20s and the house was plenty warm. The fish did not bite as well as we hoped but in the end we managed 22 walleye, 9 larger yellow perch, 1 medium white fish, and 8 eel pout of average build. On the way out of town we could not help but try to get a few more fish, but being without a fish house we had to resort to fishing out the truck windows to keep warm and to keep our reels from freezing up. The bite had almost dropped to nothing so I was pretty happy to get three small walleyes, much too small to keep but better than nothing. Here is a photo of me with one of my truck fish. The land behind me in the photo is Canada. As we headed back out of town I saw a CN train was crossing into Minnesota so I shot a video of it. As we headed back to International Falls, so we could catch the highway south, we crossed the tracks of the Boise plant engine house. There were a couple of locomotives sitting next to the engine house, I could not get closer and my Ipad does not have zoom so the photo is not that great. Just south and west of Duluth there is a town called Cloquet, where there was a Duluth and Northeastern 2-8-0 #16 on display, along with a caboose. The boss let me stop to get some photos of it. Now�. 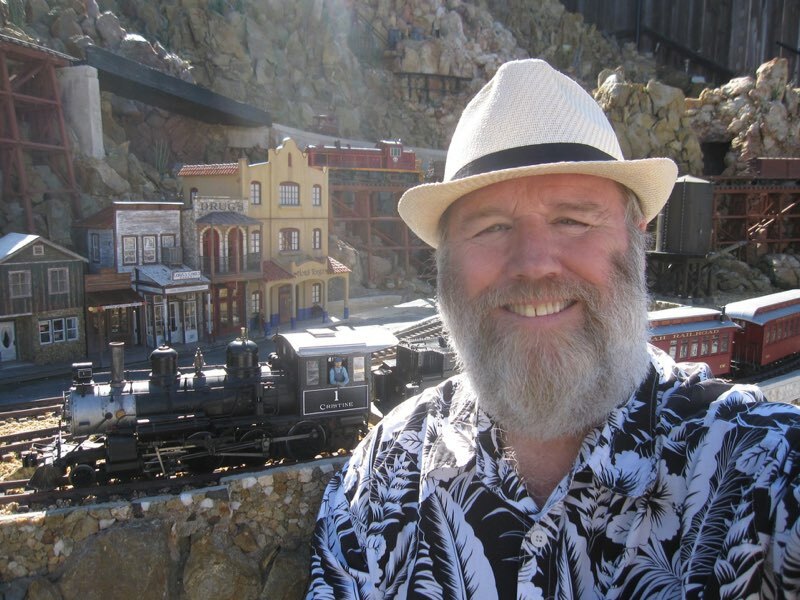 Back to building a model railroad�where is my brush, I have trees to paint. Your photos look so freezing cold, they make me cold just sitting here looking at them. I was out yesterday taking pictures of old buildings in Milford, VA yesterday ... it was sunny and in the lower 60s F.
Jeff, just reading what the temps were made me feel cold let alone seeing the snowy/icy pictures. Congrats on your catch and thanks for the pictures. At least you have ice in Minnesota! 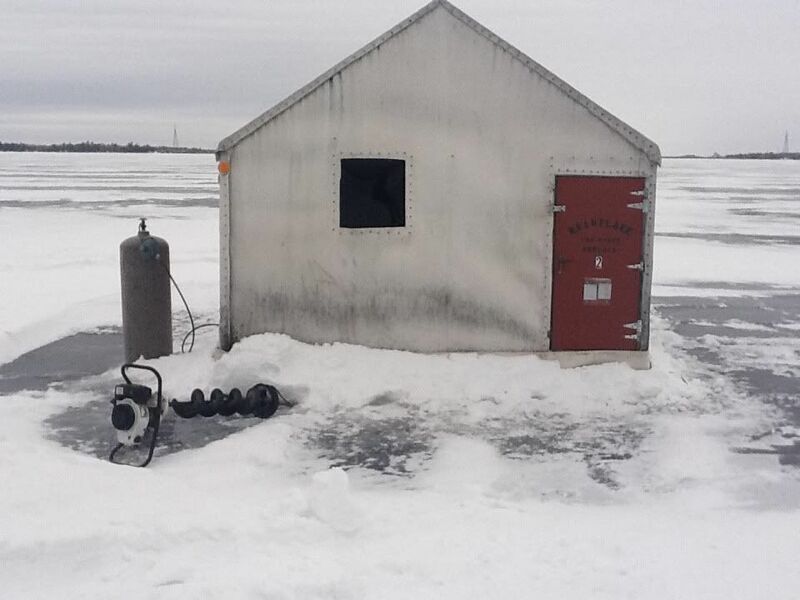 There are people over here in Wisconsin that are ice fishing next to water that is not even close to being frozen. Glad you had fun Jeff! Great pics and captions, thanks for posting. That old 2-8-0 is really nifty. But as someone who has lived in So. Cal most of his life, I can't even imagine how anyone can live in such cold places! Jeff, thanks for sharing your pictures with us- I enjoyed the pictures. Like Ray says, it's hard to understand how people can stand the cold up there. I am a hardy New Englander but very rarely does the weather go below zero and that's all I can stand. We finally hit some cold weather where I live, it will be in the negative digits this week, which I hope will get some good ice on my favorite fishing lake, Mille Lacs, which is pretty close to my house. I spent an entire day on Mille Lacs and the fish were not biting most of the day, an just before I called it quits I saw a mark show up on my sonar. I had been fishing with my brother and we decided to separate to cover some area. I was sitting all alone in the dark watching my sonar for almost an hour, thinking of trains, when I marked a fish. When it hit I could not move it, the fish just sat there, then two big head shakes and I knew I had a good one. I was fishing outside the shack most the day so my fishing reel was all frozen and I assumed my drag was frozen as well, so I flipped the reel on back reel and battled this girl for a while, I would pull her up and she would go back down, at that time I was just staring at a black hole in the floor of my shack. When I saw its head come into the ice hole I could not believe how big it looked. As I reached for it my hand slipped off the bail and the fish free spooled out a bunch of line, I thought I lost it for sure on the slack line, but when I grabbed the bail i felt the weight again, next time in the hole I didn't take a chance and I just reached down into the hole and grabbed it by the gill, when I pulled it out it seemed like it just kept coming out like there was no end. What an awesome way to end the day. BTW, after the photo I let this girl go back to fight another day. 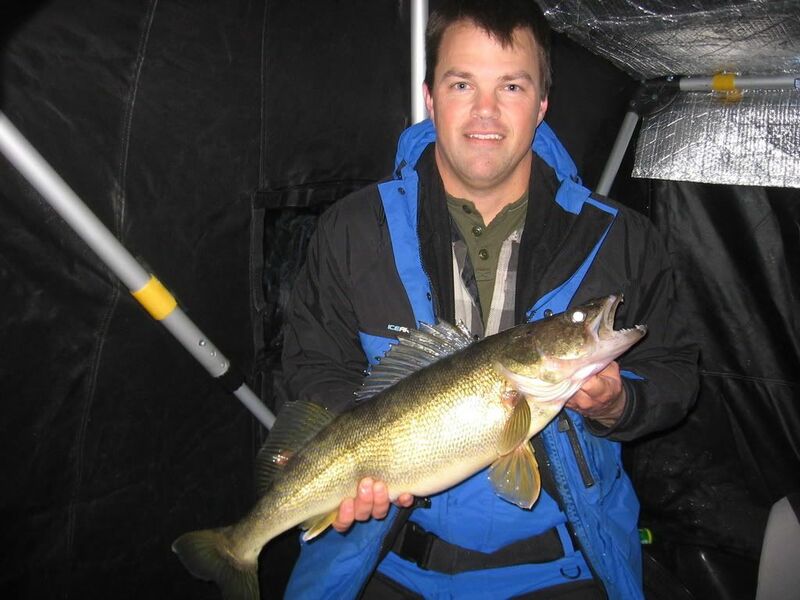 Now that's a nice Walleye, Jeff. Ok, this post got a little off topic, time to get back to the trains. I have been making good progress on the back drop, almost done. I painted some of the rock strip around the top rim which is a signature of the New River area. I think it looks pretty good but I keep going back and forth if I need more trees above the rocks. with the thought of finishing the backdrop I started on the unloading trestle. I constructed the dump bin and the east approach trestle. 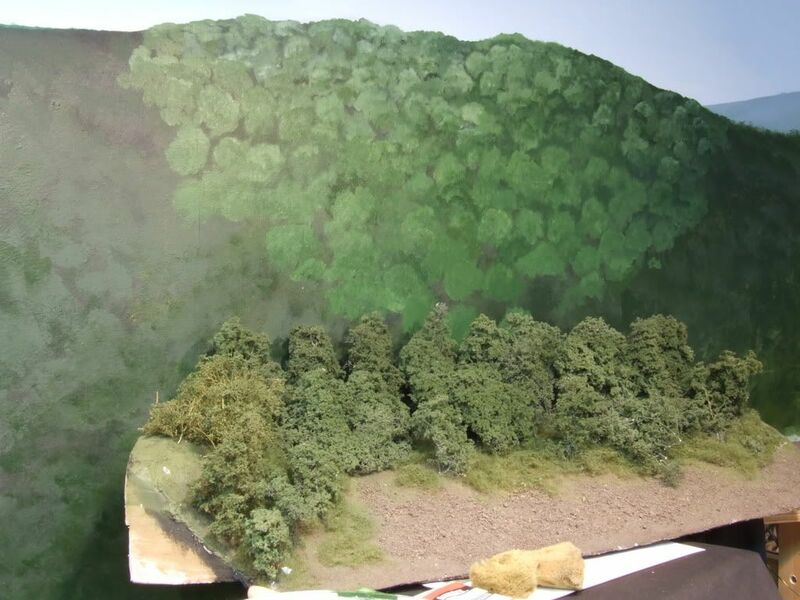 After I get the west approach done I will build and install some footings in the scenery. The first set of hoppers I build use a DCC decoder to operate the door motor, which works really good but I have had an accident that has made me think that I may want to operate the doors differently. I was testing the doors on a hopper car and I selected the wrong address, which opened the doors on a different car, which happened to be loaded. It made me think that if that happened to a car sitting in hidden staging it would be a real pain to clean that mess up. I also got a little concerened with the friction the pickups are causing on the hopper wheels, the cars are really hard to pull and I am afraid that it is putting too much strain on my locomotives. 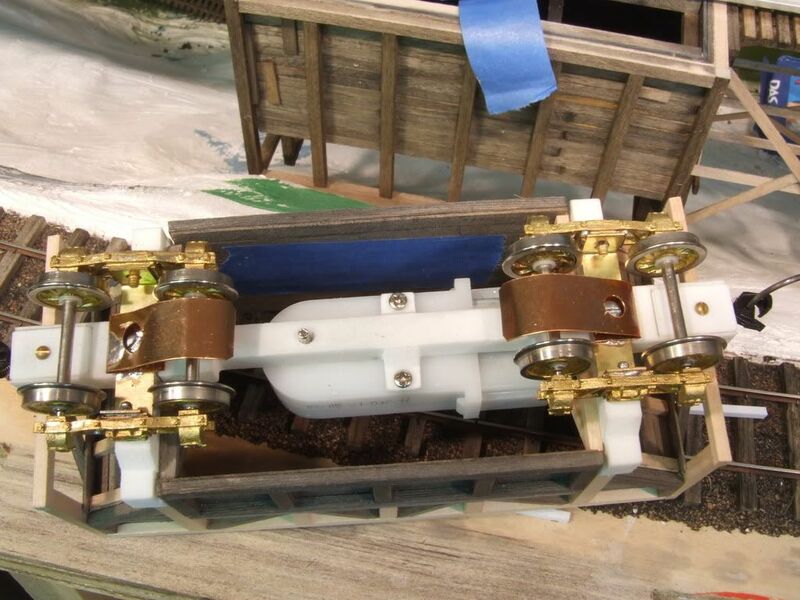 I built a test hopper that has a set of contacts I made from phosphor bronze sheet. the contacts are well hidden from sight and they ride higher than the rails. I went to the hobby store and got some slot car braid which I am going to mount on some retractable rods inside the dump bin. after the locomotive crosses the bin I can raise the braids and when I spot a car over the bin the braids will make contact with the hopper car contacts and a toggle switch will be used to open and close the hopper car doors. I also though that maybe I can connect the switch to a digital recorder that will play the sound of a hopper car unloading coal or rock. I have been testing with ground rubber for coal but it makes no sound when unloaded, so the sound of real coal unloading would be pretty cool. 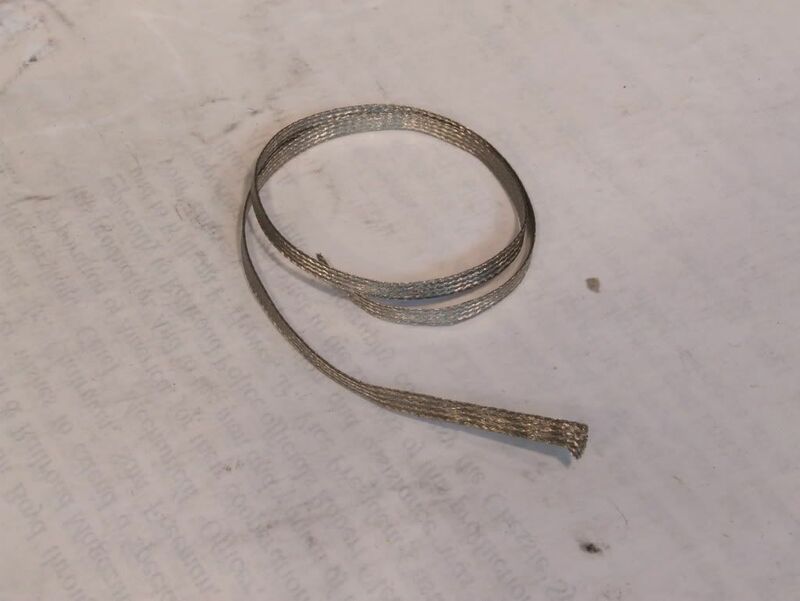 here is the stainless steel slot car braid, it is really soft and makes really good contact. I even though that I may not have to make it retractable because it is soft enough that maybe I can just run over it with the locomotive. Your persistence is paying off ... both with fishing and the backdrop. Looks very good. What happens when the tipple gets filled with coal? the holding bin is actually an inner shell and an outter shell, the inner shell is made from black styrene and is shaped like a funnel, all the sides slope to a small 1 1/2" square opening that goes to a tube that goes straight down through the scenery and into a can that I can remove and empty. The outter shell, as you can see, makes it look like the coal will slope down toward the backdrop, where a sizing plant will be. 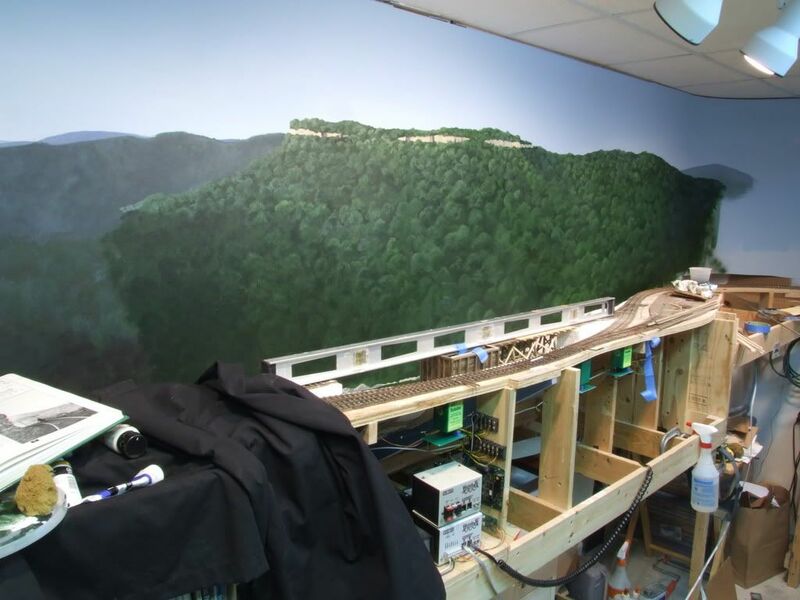 I still have some fake bracing to add under the unloading bin, which will help hide the tube that goes through the scenery, it is well hidden in the photo but I want to make sure it can't be seen from other angles. 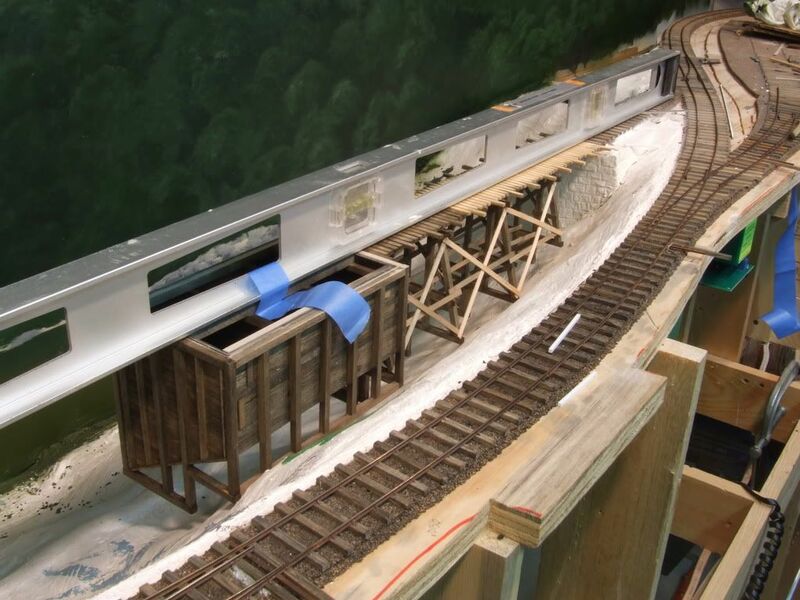 Also, there will be a bridge that will cross from the aisle side to the bin to allow dump trucks to dump into the unloading bin as well as the hopper cars. Over the bin will be a shed and there will be a walkway down the sides of the trestles. there is a lot more to build but I need to get the base in so I can start testing which hopper cars work better, the DCC cars or the cars with contacts. 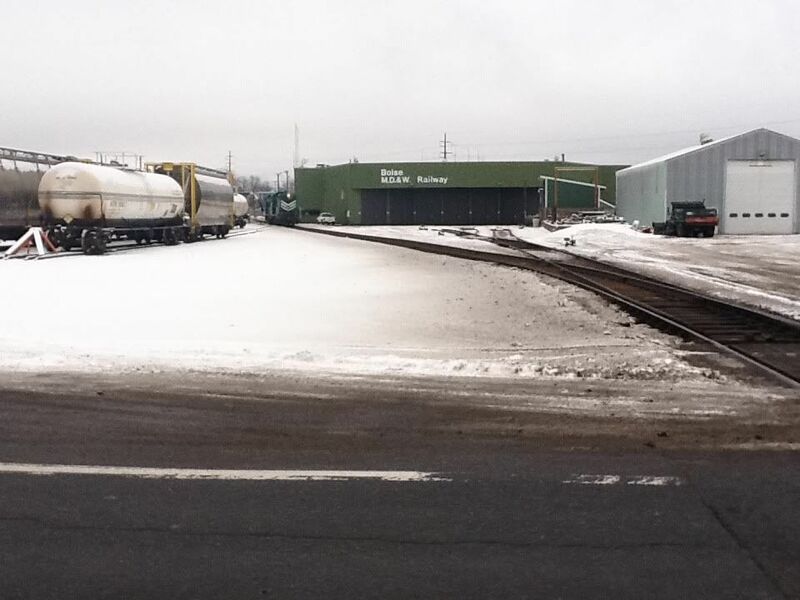 You're going to have hopper cars that actually dump their loads on command?! That's too cool! BTW the backdrop looks great. I like the slightly hazy look.